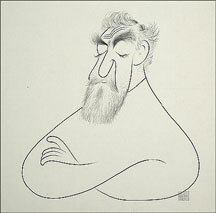 He died just shy of 100, the greatest and best-known caricaturist of the 20th century, and he drew until the very end. It is odd to say he was underrated, but familiarity bred, if not contempt, then more familiarity and when you saw him every week in the Sunday Times it was easy to forget what a master of line and tone he was, how much he could do with how little. I just had the good fortune of meeting his widow when my client and friend bought his house. Very nice woman.